Grassroots creates a showcase of talents throughout handmade arts to music, dance and more. The festival experience is rich, extensive and often exhaustive. An experience not to miss. Juggling many responsibilities, I was only able to catch a few performances. I’m thrilled Danielle Ponder and The Tomorrow People was one of these bands! Their performance enlivened and uplifted the afternoon’s crowd, dancing in mud near the stage. I’ve been playing their videos and talking about this band since Grassroots. Luckily, I found out about a soft/grand opening for F.L.X. Live in Geneva with Danielle Ponder and The Tomorrow People headlining! A hot ticket with limited availability, I scooped mine up quickly at Area Records in Geneva. 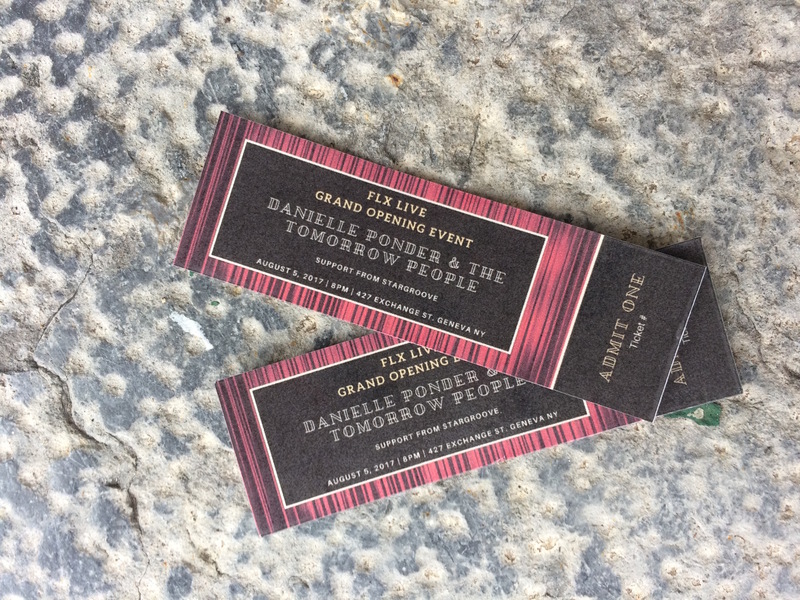 Two tickets for Danielle Ponder and The Tomorrow People for the soft/grand opening of F.L.X.Live! The band’s performance in the brand new, intimate venue was epic. Danielle Ponder’s powerful performance and her tight, happy band bring dazzling energy and stir the willing into a dancing frenzy! This impromptu visit to Geneva was excellent. Dinner at The Red Dove Tavern was impressive and casual. Beginning our evening with Rose Cava and Champagne set the tone for a fabulous time. Professional, friendly service welcomed us to the noisy tavern, while our food mesmerized our attention and tastebuds. Cavatelli in a lemon artichoke broth with shrimp pleased me while my friend had flank steak sandwich and fries. Peach cobbler and great coffee made the pleasant surprise complete. 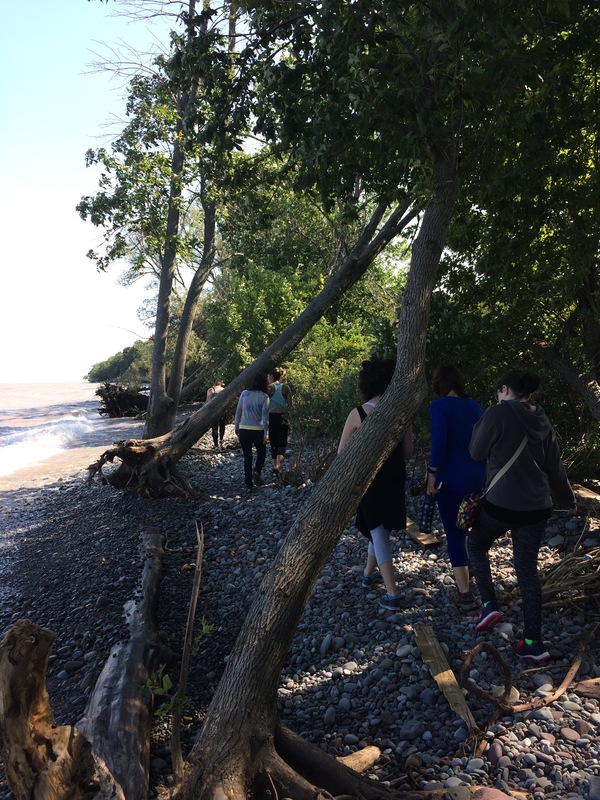 A yoga eco hike along Lake Ontario’s shore at Sterling Nature Center worked any muscles I missed dancing the previous night! 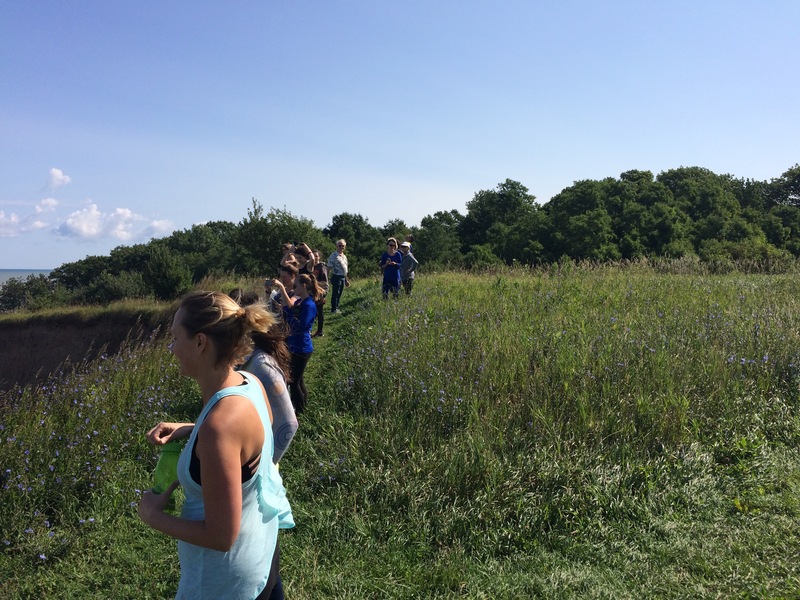 Leading this hike with Karen Haas of Bayview Wellness Center is incredible fun. Poses throughout our hike lent themselves to each place we visited August 6 at 9am. 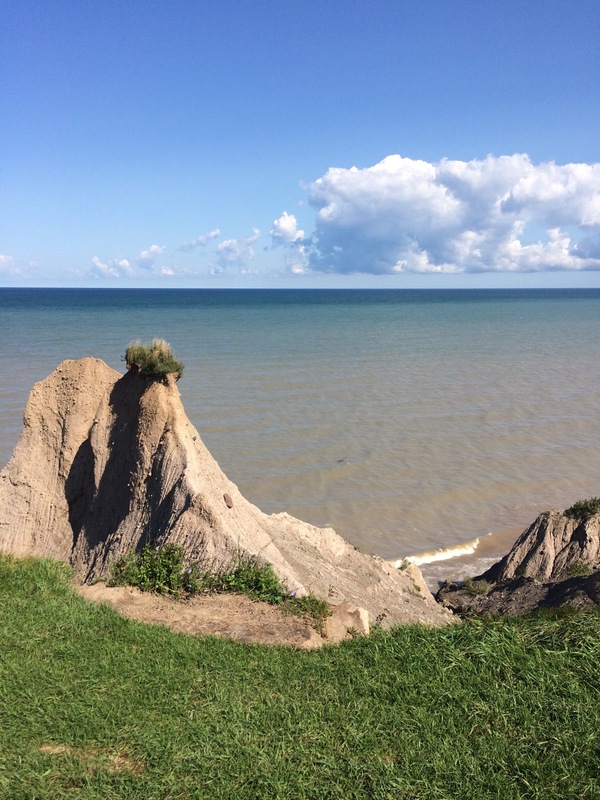 Our group was diverse, with participants in their early teens and the span of adulthood. Men and women came from Baldwinsville, Fulton, Oswego, North Rose, Fair Haven and more to gather together for this yoga walk. From the smiling faces, pictures and sincere thanks, I think people enjoyed themselves. Practicing group yoga on a pebble beach in synchronicity with our breath and crashing waves was awesome. A downed tree provided a challenge for each of us, that many conquered with group support. Walking up a steep trail to a large meadow looking off MacIntrye Bluffs over Lake Ontario warmed us before a series of poses a safe distance from the edge. These poses were challenging, my legs often wobbling and my hip muscles screaming! For some reason, the pain was comical to me. Karen humored me, instructing the group to place their arms upon each other’s shoulders and move into a warrior pose where it was as if we were an eagle about to soar to Canada. Brilliant! 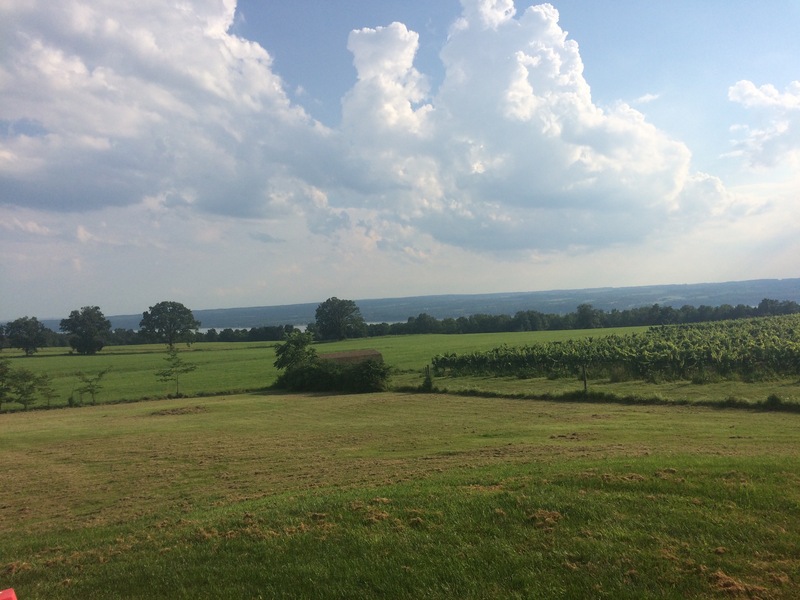 Before long, I was setting up at Aurora Ale and Lager Co. on the east side of Cayuga Lake. An old farm is the perfect setting to enjoy the beers of this nano-brewery. Their Mango Infused Goseface Killah Gose recently won Bronze at the New York Craft Beer Competition and Governor’s Excelsior Cup. All of this is making me hungry and thirsty! Where to next? Somewhere lovely, for sure. Coming soon! Updates regarding our Monarch butterfly project.